How Roman construction techniques influenced a classic design phenomenon. What was I doing in Bulgaria? A lot of people asked me this. Well I was fortunate enough to have an ulterior motive, accompanying the Maestro for the debut of his orchestral piece Certitude and Joy played by the Sofia Philharmonic (and which was *ahem* dedicated to moi) but also what I was doing in Bulgaria, what I usually do, of course, looking for beautifully painted architecture. 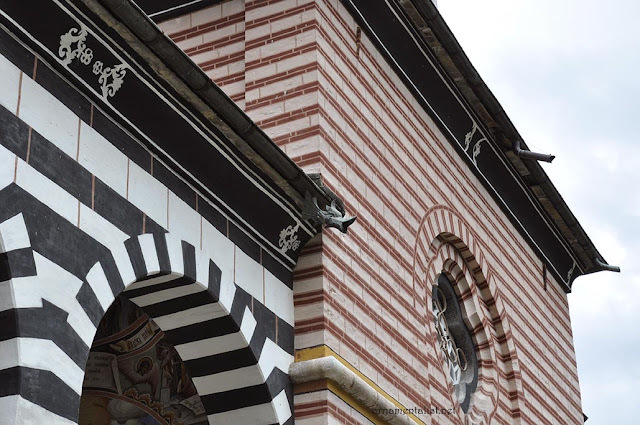 So there we are at the famous Rila Monastery, built in the 19th century in the Bulgarian National Revival style, and I notice the brick stripes of the walls and arches are painted. Of course they are making an obvious reference to the Roman walls that are all over the country as this area was part of the Roman Empire, and the Byzantine Empire, and then of course the Ottoman Empire. 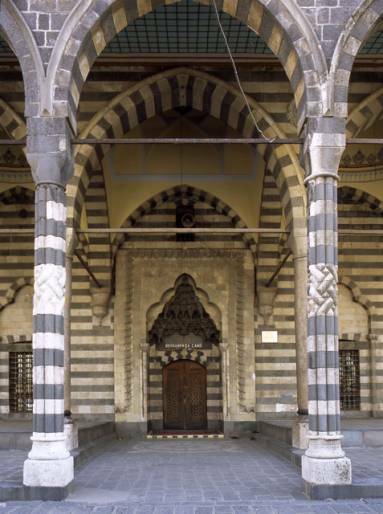 Also prominently featured are the black and white stripes so common in Ottoman mosques. The "Opus Listatum" pattern is typical of late Roman walls, which were built with a core of concrete and faced with alternating "stripes" of brick and rock ("rock" sometimes being salvage from older buildings.) This was generally done to save on costs as bricks were becoming rather expensive. 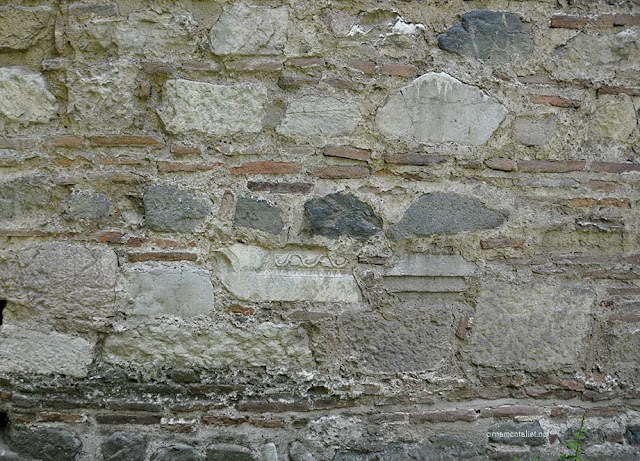 This look became more deliberate and ornamental in Byzantine architecture, as seen in the Theodosian Walls of Constantinople constructed around 440 AD, and it then influenced the design of mosques and ablaq style masonry, and over the centuries worked its way back to Italy where alternating black and white striped stone walls graced churches and palaces. Currently a trend in fashion and a perennial design motif in contemporary interiors, black and white stripes seem to be everywhere in design magazines these days. And I am sure red and white stripes will have their day again soon! 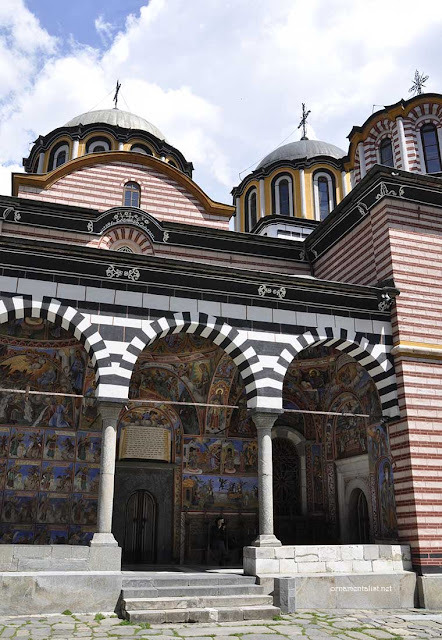 Back again to Bulgaria, where Revival architects and designers in the 19th century made reference to two major influences in their culture in the form of Roman and Ottoman occupations of their country. I have to say I like both stripe patterns, I particularly like them used together, as they provided architectural and graphic support to the amazing colorful murals adorning the porch arcade. Having a Revelation at Rila Monastery. My scarf is pure coincidence. Or is it? 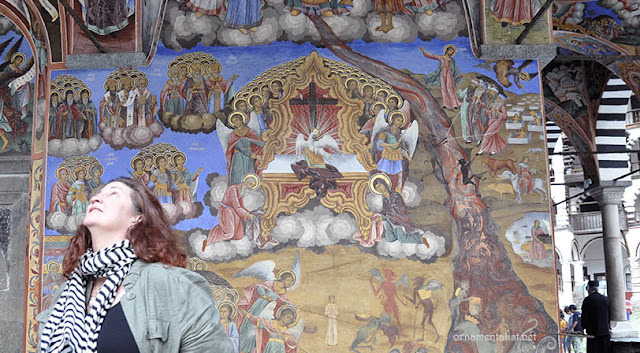 Watch this space for future posts about Rila Monastery and its fabulous murals. I have always loved banding...the Medici's did their share using it as well. The monestary in Bulgaria is almost edible. Fab pic of you with the scarf! Oh, that's funny, Lynne! Nice little b&w stripe inclusion at the end. That monastery is wild! So much to take in. And here I thought Firenze's duomo was lively. Wonderful! Thoroughly enjoyed this, Lynne. And yes, I believe I will keep watching this space for more on the Rila Monastery...and beyond! You were in Sofia and skipped the Alexander Nevsky Cathedral?! It's gorgeous! 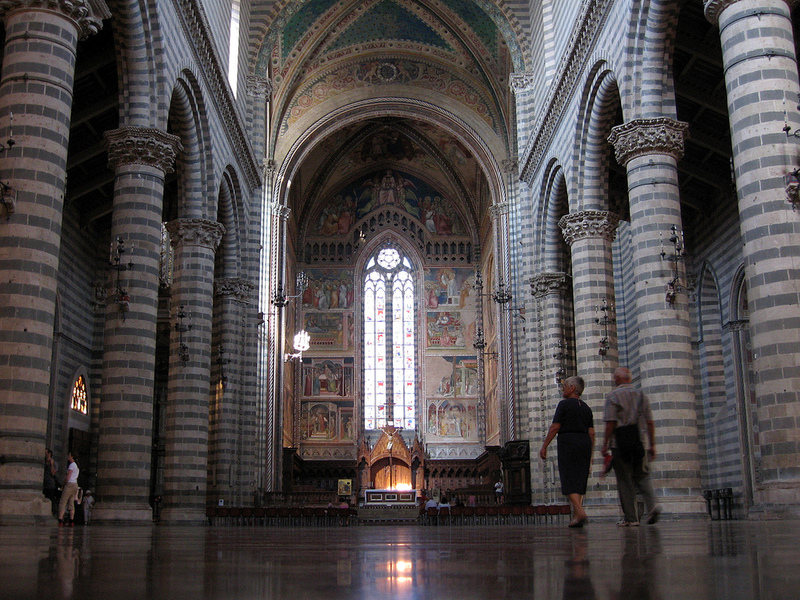 From a distance it looks like just a beautiful cathedral but up close the mosaics are unbelievable! Though they are over 200 years old, the skin tones are fabulous! I do hope you get a chance to set it. It's breathtaking! oh I forgot to give photo credit to Erling for that last picture. In fact he took dozens of shots of me taking pictures, which has become one of his main activities when we travel. Hi Cindy of course I went to the Nevsky cathedral, and got up close to the mosaics in its porch, which really are unbelievable, because they are all brilliantly painted and not real mosaic at all... more about that later! Hi, Lynne - It's good to have you back again. 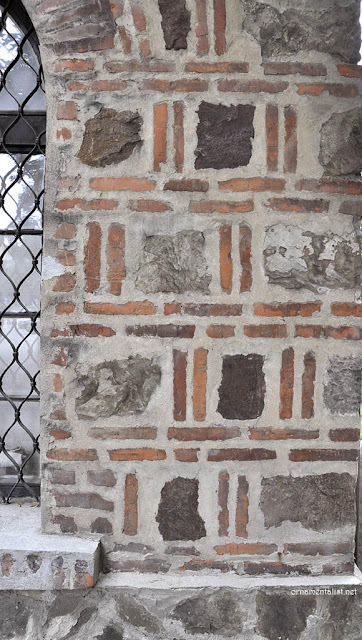 I was not familiar with the Opus Listatum pattern of brick and stone - it reminds me of the english Tudor period. 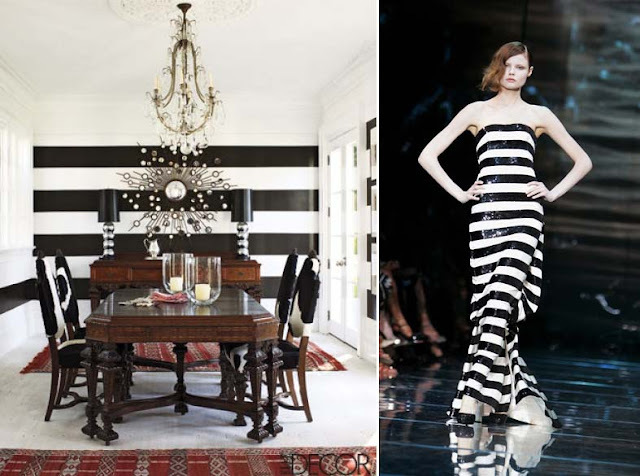 And I like seeing all the stripe patterns, inspiration perhaps for one of my doors. Nice one. Never heard of that term before, but I've always loved the stripes. Many a striped scarf and shirt in my closet. Even pants! Hi Lynne, I just got a google alert for DesignInspiration and it was about you in the San Fran Chronicle. Hurrah, I wrote them an email praising your talent! Just about to buy striped top from Anthropologie in the hope of making me look slimmer. Oh the monastery is spectacular - adore the striping detail. Love stripes, but I'm now needing mine to run vertically!! So I just read that Bulgaria produces 85% of the world's rose oil. Did you also run into the roses by chance?